Six met in Hathersage for a ride around the Hope Valley, starting with an ascent to the transmitter above Bradwell, then descending the fairly exciting Bradwell Edge. Second ascent was round the top of the cement works quarry and across the top to Mam Tor. Descent from here to Edale via Hollins Cross was more exciting. The remaining five, on a mixture of steeds, mostly from this century, having completed the ascent, descended with much enjoyment to Aston via Twitchill Farm and returned to Hathersage via Thornhill and the old railway line to Bamford. The chief technical officer recorded a distance of 42.5km and 850ish meters of ascent. The meet leader apologises for not making the promised 1000 – 1200m of ascent and will try harder next time. The changing of the clocks obviously affected some people [you know who you are!] but eventually around 10 climbers, 3 dogs and a visiting Mary assembled on a bright morning which had a cool wind on top but was remarkably sheltered and positively warm on the crag. We were joined by an RAF group learning the ropes and a University group climbing lots of steep routes which meant we had to settle for the lower grades!! A typical early season meet saw lots of ascents of the popular easier routes, including several members opting for the advertised starred Mod, alongside some ‘slightly’ harder efforts such as Kial and Gemma on trapeze Direct etc. By 4pm most of us were feeling the strain after several months away from the gritstone and made our way home after an enjoyable and sociable day. I’ll try putting a couple of pics on Facebook if it’s working again. Three met at Calver crossroads for a ride: Coombs Dale to Black Harry Gate; double back to Deep Rake; down to Rowland, Great Longstone; up to top of Longstone Edge; through (padlocked!) gate on bridleway north to Black Harry Gate again; continue north to Eyam; down byway to Stoney; back along mani road to Calver. The leader had to stop for a quick caffeine and sugar hit on the way up to Longstone Edge; otherwise it was a non-stop ride, resisting cafe temptation, taking around 2.5 hours. Alternate warm sunshine and driving hail were in keeping with the season. Going by the rule that if your pants are dry after mountain biking, you should have gone climbing (and vice-versa) – it was the right activity for the day. 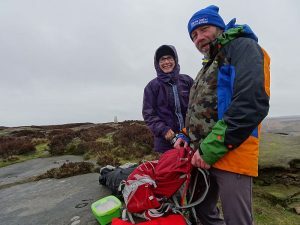 Sadly the light drizzle seemed to deter our hardy mountaineering folk, so just Leon, Josie and the meet leader set off from Redmires car park at 10am. Yes, it was a dull day, and spitting, but never bad in the time that we were out. We walked down past the Headstone, across the A57 and up to Crawshaw Lodge where a decision was made that we would all omit the loop north of the old Sheffield road and head along it to Moscar Cross. A coffee stop here fortified us in the cooling breeze and we set off for Stanage end. We met one runner and a couple of walkers along the edge, but it was a quiet day ont’hills. A lunch stop was taken at High Neb, then the return to the cars made via Stanage Pole. We were back before 2pm, and well before the first heavy shower of the day. A shortened day, but still 8.5 miles by Leon’s GPS, and enjoyed by all 3. Dave. A group of eight and Poppy gathered on a very cold morning and under an overcast sky we followed the frozen footpath up to Derwent Edge. At Whinstone Lee Tor not only were we feeling warmer but the sun had reappeared and the clouds were dispersing. Snow covered the landscape as far as the eye could see in all directions, and below us patches of ice were visible on Ladybower reservoir. We continued along the edge into a cold fresh breeze, with hard packed snow underfoot. In the lee of Back Tor we had a brief break, before making our way to Lost Lad. Again we paused briefly to admire the all-round views, and the sharp sighted amongst us were able to identify the Holme Moss mast in the far distance. We descended to a small plantation for an early lunch, a fallen tree providing a convenient seat. We did not linger long, and made our way down to the side of the reservoir, feeling warmer out of the wind. A short walk brought us to the path up Grindle Clough. Avoiding the ice underfoot and the mountain bikers approaching us from both directions, made for an interesting ascent back to the Edge. Here we took the path by the grouse butts until it crossed the unfamiliar (to some) Highshaw Clough. We followed the clough back to the main path and Cutthroat Bridge, just as the drizzle and predicted thaw arrived. An excellent winter walk in almost perfect conditions. 10.2 miles, and thanks to all who came. 8 of us met at Low Bradfield and set off for Dale Dike Reservoir in welcoming sunshine and well sheltered from the strong winds. Taking the south bank of the reservoir we crossed below the overflow channel of the Strines reservoir above and stopped for a tea break in the woods below Brogging.Continuing around the north of Dale Dike we then headed up Wilkin Hill and into the woodland around the western arm of Agden reservoir. Lunch was taken ,well sheltered, in the woodland stream flowing into the reservoir at it’s western end.We then headed north steeply up Agden Side.Reaching the top we were greeted by all round views and the strong northerly wind.Continuing along the ridge we admired the view of Agden Rocher Edge beautifully lit up by the afternoon sun.Traversing below the edge we continued through the woods to the exquisitely sited St. Nicholas Church with it’s commanding views of the upper Loxley valley and the Agden and Dale Dike reservoirs.Some of the inscriptions on the tombstones were were noted including one to a local resident which (after giving his name)finished abruptly with the comment “who died”- but with no date or further comment! The final loop on the Sheffield Country walk maintained the elevated position with the commanding views of the valley below and a snow covered Derwent Edge in the distance.We then descended through the fields back to Low Bradfield. An enjoyable day with great views and lovely light in this outstanding area. Thanks to all who came for your company. Ten people met at Wildboar Clough car park before setting off in the clag along a pleasant woodland path through ankle deep snow. Arriving at Three Shires Head we admired the two dip pools. Note to self and other wild swimmers – definitely worth a return trip mid week when warmer. Here we paused for a snack and debated the directions of Cheshire, Derbyshire and Staffordshire. Onward we trod through the mist, mostly following tracks and minor roads. We stopped again on top of Axe Edge Moor for a short lunch break, with nowhere else to sit but in the snow. Unfortunately, there were no views of the Goyt Valley, as advertised, until mile 9, just outside The Cat and Fiddle. Blue sky broke through and glimpses of distant skylines most welcomed. The terrain became more interesting here as we descended into the stream gully, of Danethorne Hollow, before arriving at the carpark, shortly afterwards. A 10.5 mile round completed – thanks to all who turned out. Thanks to all 19 members who made this such a sociable weekend in the comfortable FRCC hut Raw Head. Unfortunately this year not a trace of snow or ice – in fact out of the wind jackets off was the dress code! Sue M and myself took advantage of Friday’s good forecast to ascend Pike of Blisco meeting John S and Kathy at the summit – fabulous all round views. A cozy evening round the coal fire on Friday as we all arrived. Saturday forecast rain and increasingly strong winds and parties did various routes to Lingmoor Fell, Elterwater to Cathedral Quarries and Red Tarn by various running and walking routes, with Vanda, Paul and Hugh getting back last to the hut after a very wet ascent of Browney Gill and The Old Dungeon Ghyll. Fantastic teamwork organised by site supervisor Leon had us consuming 6 different home cooked curries. We managed to eat them all and the apple crumble from John B and birthday cake made by Josie for Leon! Sunday’s forecast of more rain and winds gusting 60mph didn’t deter Gemma and Kial from running up to Red Tarn and getting back before the Bowfell party of 6 set off! We got as far as Three Tarns after an interesting river crossing at the foot of Hell Gill before the strong gusts persuaded us to head down and homewards meeting Sean at the hut who had been blown along Mickleden.